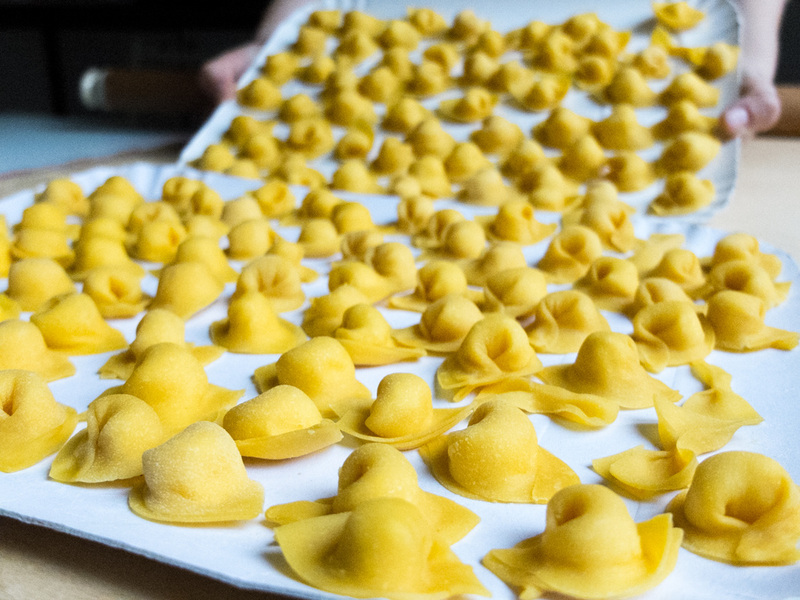 Undisputed king of pasta dishes in Romagna, cappelletti are a must on a table during family celebrations, important anniversaries and, of course, on Christmas day. 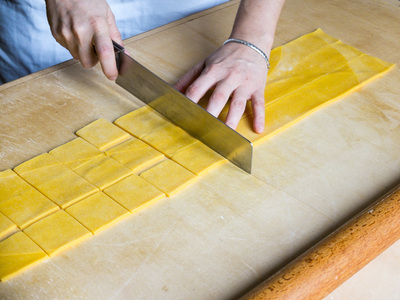 The name (which in Italian means “small hats”) comes from its shape, i.e. that of Napoleonic or a priest’s hat depending on different opinions. 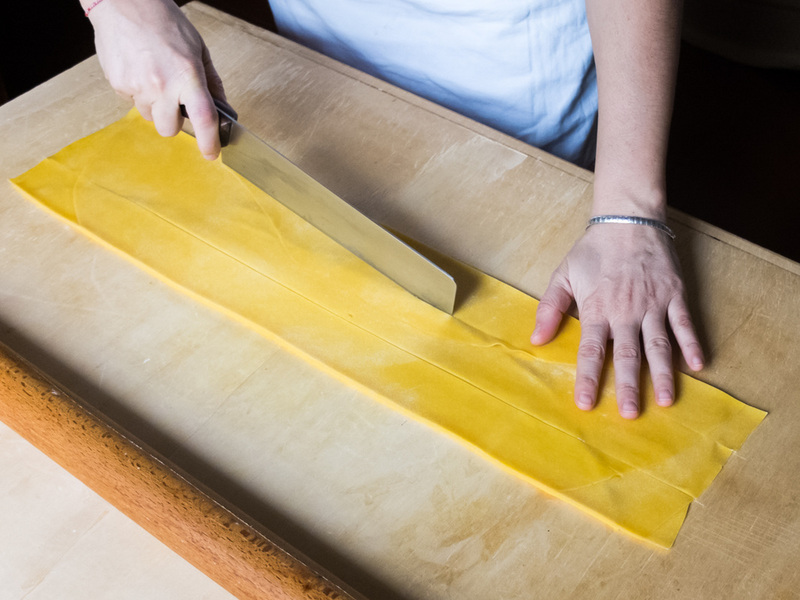 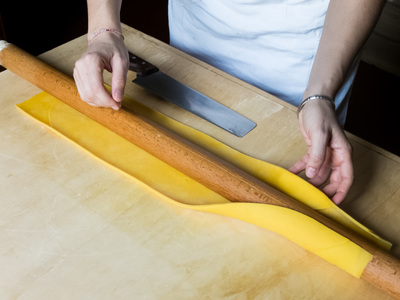 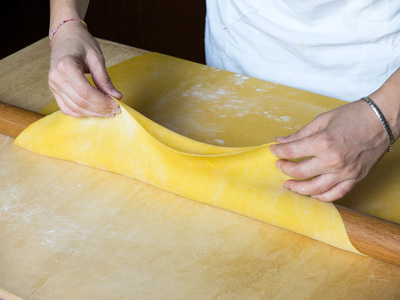 Whichever the case, it is a filled pasta whose diameter is never more than 3-4 centimeters. 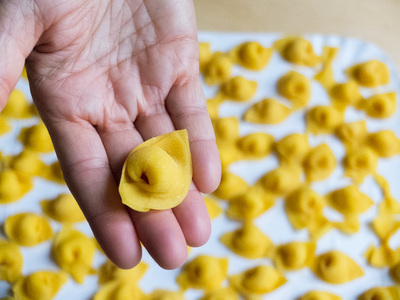 For those of you familiar with the more famous “tortellini bolognesi” there is an important difference between the two kinds of pasta, namely the filling, the so-called batú. While the tortellini may have different fillings, in the region of Bassa Romagna cheese is used exclusively thus also in my recipe here. Typically and historically, cappelletti were served in broth but I can guarantee they are also divine dry: you can go from a very strong flavor of those with the sauce to a milder version exalting flavor of the filling only seasoned with butter and nutmeg, and on to an even more delicate and intriguing variety as the cappelletti with asparagus. 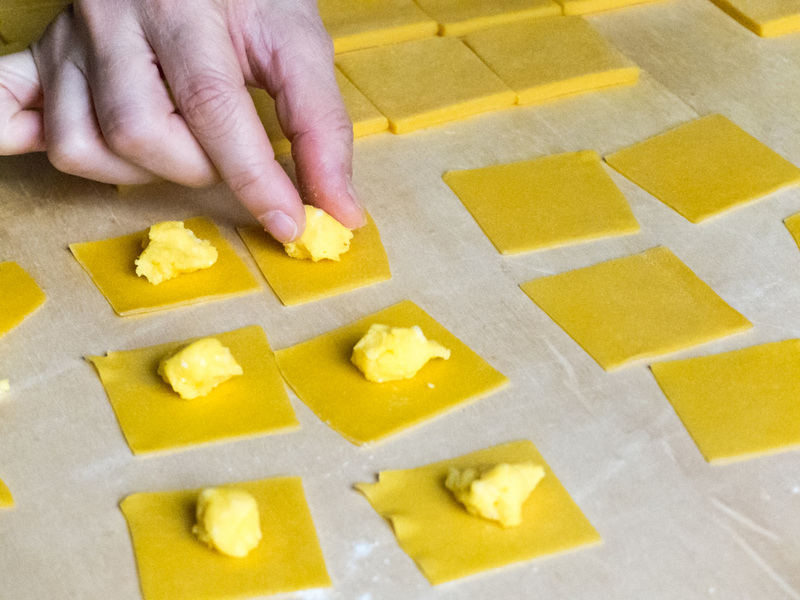 Prepare the stuffing of Cappelletti by mixing all the ingredients in order to get a quite substantial dough. 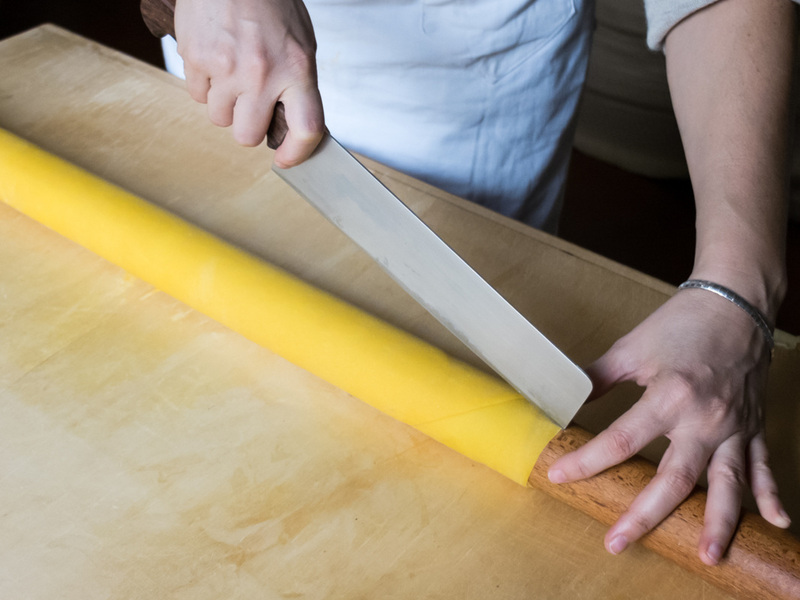 The more you let parmesan cheese prevail on soft cheese, the more flavorful will your pasta have. 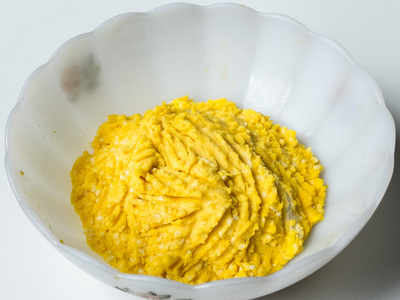 The difference in the mix of the two cheeses is linked to the territory and the recipe for the filling can also vary from one village to another. My grandmother with her "highland" origins (hills above Faenza) used to mix the two cheese qualities half and half, then when she moved to Villanova di Bagnacavallo she adapted to the customs of the village, where they only use parmesan cheese. 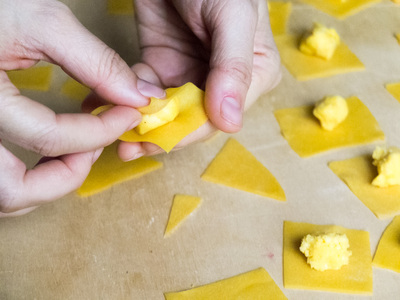 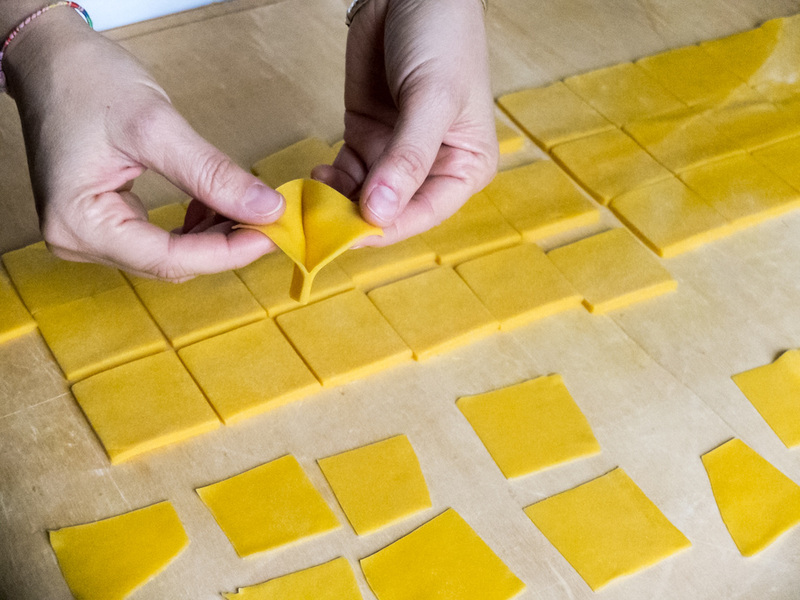 Roll the dough fairly thin and cut it into small squares of about 3 cm per side. Once you place the filling in the center, fold the square in half diagonally, pushing the edges with your fingers to release the air and make sure to attach the two edges well together. 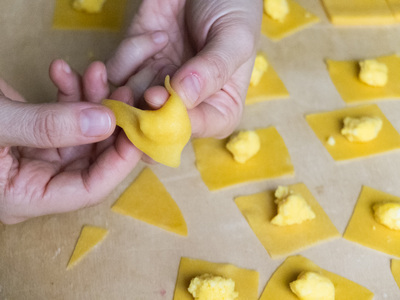 Then attach the two far ends by turning the stuffed side around your finger and shape it into a small Napoleon hat. Make sure that the dough does not dry out too much, otherwise the Cappelletti won’t close well. NB: there is nothing better than freshly made and eaten pasta! However, the fact remains that all the pasta can be frozen and eaten at a later time. 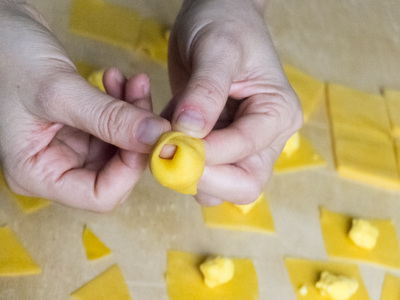 Frozen cappelletti should be taken out of the freezer at least half an hour before, so that it can partially thaw and thus won’t break when thrown into boiling water.